Undefined CE preparations to increase the colonization resistance of chicks against Salmonella or other pathogens are already available in non European markets. They are usually preparations originating from cecal content and pose the risk, due to their unknown bacterial composition, that they can contain pathogenic bacteria or viruses for poultry and or humans. In a defined CE preparation the inclusion of any potential avian or human pathogens can be avoided. Biomin has put a lot of effort into the development of a defined CE product for poultry consisting of a blend of beneficial bacteria isolated from healthy chicken. Competitive exclusion (CE) is a term to describe the process by which beneficial bacteria in the gastrointestinal tract exclude pathogenic microorganism. CE mechanisms are still not fully understood but following modes of action are proposed in literature. 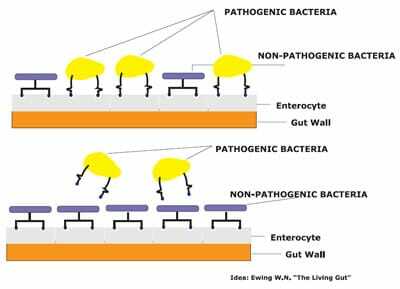 A physical competition for attachment sites occurs on the gut wall, where normal gut bacteria adhere to the mucosa to occupy receptors, which can also be used by pathogenic bacteria, blocking the establishment of transient pathogenic bacteria (figure 1). Furthermore the pH is reduced in the intestine through increased production of volatile fatty acids (VFA) and lactate. Antibacterial substances like bacteroicins are produced and a competition for nutrients takes place. Probiotics are defined as "Live microbial feed supplements" which beneficially affect the host animal by improving its intestinal microbial balance. 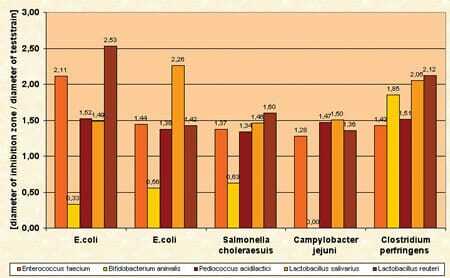 Probiotic bacteria are selected for their potential to provide specific health or nutritional effects to the animal. Strategies are aimed towards stimulation of the growth of beneficial bacteria and suppression of potentially harmful microorganisms. Probiotics are health-promoting microorganisms that are useful for protection against infection. For the development of PoultryStar® intensive research work in our own laboratories and in collaboration with several universities and partners from industry was carried out. The research work was supported by the Commission of the European Union. The product development process started with the isolation of intestinal bacteria out of the gut of several healthy chickens, thus providing a rationale for their safe use as a feed additive for poultry. To obtain the most efficient strains, it was decided to use intestinal contents of different origin, selecting chicken of different ages and genotype. A pool of diverse aerobic, facultative anaerobic and obligate anaerobic gut bacteria was isolated out of four main intestinal compartments – the crop, jejunum, ileum and the cecum – using a wide variety of conventional microbiological cultivation techniques (figure 2). Pure cultures of isolates were stored for further investigations and thoroughly characterized with regard to their metabolic properties, growth and fermentation performance, adaptability to industrial processes, stability in the end product and inhibitory activities. The most promising strains were evaluated for important probiotic criteria such as adhesion to intestinal cell walls, inhibition of pathogens, range of metabolic end products, fermentation performance, stability against acids and bile salts, storage stability and safety status. In order to investigate the adhesion ability of various isolates to intestinal cells a tissue culture test system was used. The received results clearly showed the ability of several isolates to attach to intestinal cells in vitro. A co-cultivation agar plate assay was used to test the isolates for their ability to inhibit the growth of pathogens like Salmonella enteritidis, Salmonella typhimurium, Salmonella choleraesuis, Campylobacter jejuni, E. coli and Clostridium perfringens (figure 3). Several isolates had the ability to inhibit pathogenic strains and the results showed furthermore that the inhibition potential of single strains against the pathogens was quite different (figure 4). On the basis of the collected results, it was decided to combine five very promising chicken strains of different species affiliation from the crop, jejunum, ileum and cecum of broilers to design a multispecies product. heterofermentative bifidobacteria (B. animalis) producing acetate and lactate. 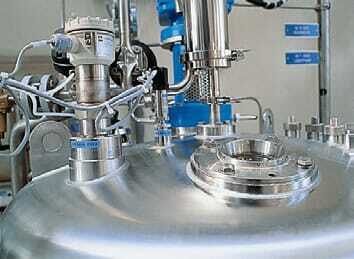 Safety assessment was an essential phase in the development of the probiotic feed additive fo Biomin. Each single strain of the final product was carefully evaluated for safety. Furthermore an economic fermentation process with highest quality standards for the production of the selected product strains was developed (figure 5). Besides the five probiotic strains PoultryStar® contains the prebiotic inulin which selectively stimulates the growth of Bifidobacteria and immune-modulating cell wall fragments that enhance the weak innate immune system of day old chicks and furthermore improve the infection resistance in the gut. The efficacy of PoultryStar® in improving performance parameters and Competitive Exclusion of Salmonella have already be confirmed in several feeding trials.